Litter box liners are created for the convenience of the cat parent but they often tear from the cat’s claws. It’s also easy for urine to form pools in the folds of the plastic and that creates an odor problem. Since cats are very tactile you also have to keep in mind how the plastic may create discomfort when a cat is trying to dig and cover his waste. Don’t be stingy when it comes to filling the litter box. If you don’t want to create an odor problem, put an adequate amount of litter in the box and keep the level consistent. In general, about 3 inches of litter is a good amount. As you scoop, periodically top off the litter with a bit more to keep a consistent amount. In general, cats like an unscented, sand-like substrate. They like the soft feel on their paws and the sand-like litter makes it easy for digging and covering. Cats also don’t want to smell all the flowery, perfumed litters. Keep in mind how close your cat’s nose will be to the litter when he’s in the box. Texture is also important when it comes to litter. There are so many litters on the market that are created to appeal to the convenience of the cat parent but in many cases they are just a litter box problem waiting to happen. 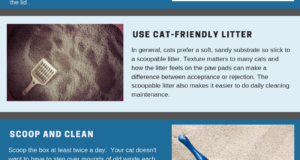 While some cats may prefer the texture of an alternative litter, most prefer an unscented, soft, scoopable litter. Whether the stress is due to multicat issues, household chaos or sudden changes (such as a move, renovation, new baby, new spouse, etc. ), the effect can end up being litter box aversion. 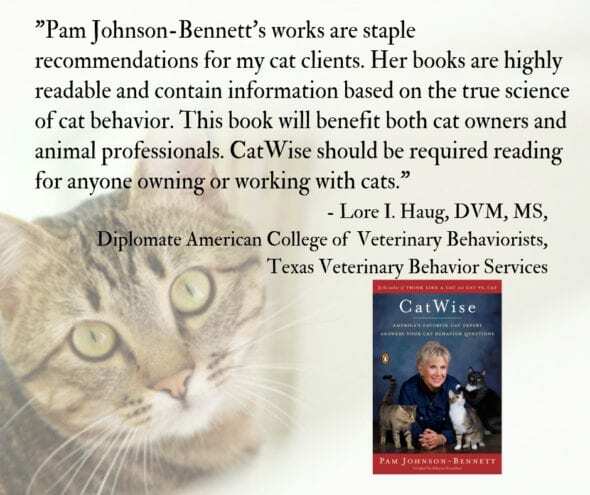 Cats are creatures of habit who don’t adjust well to abrupt changes or chaotic environments. A litter box avoidance problem may be the result of your cat being too fearful to even peek his head out from under the bed. 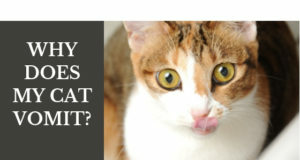 Address multicat tension issues and/or environmental factors in order to provide your cat a sense of security and safety in his own territory. Electronic self-cleaning boxes have so many downsides that I don’t even know where to start. Many of them have motors that are frightening. Some are so big but the actual surface area for the cat is too small. Many self-cleaning boxes have covers as well. Even though some of these boxes are timed to not activate the cleaning until 10 minutes after the cat has left the box it doesn’t account for another cat entering. Some rakes in the boxes easily clog when there’s a large clump due to diarrhea. The other important downside to a self-cleaning box is that you are prevented from monitoring what is or isn’t happening in the litter box. When you clean the box it’s an opportunity to check on your cat’s health. It’s during cleaning time that you may notice constipation, diarrhea, a larger-than-normal urine clump or no urine clump at all. a bigger problem there is me and my mom I’m 54 and she’s in her early 70’s with arthritis . Very nice article! I never realized how sensitive my cats nose is. I have always bought litter for my nose convenience instead of her needs. I am going to try cleaning out this new litter box I have and then filling it with unscented litter. Then I can see if that helps. Please pray that it does! I will be getting back with you either way by how it goes. Plus that I have already taken her to the vet because of this problem and an ear infection. He put her on an antibiotic, which I had a hard time giving it to her, so the infection hasn’t already all of the way healed. So unless the LOrd heals her I am half expecting for her to get that fully back. My cat Patch is not using the litter box! He has had 2 cases of urinary stones or crystals and I saved his life both times but he now poops and pees outside the litter box continuously. I think he associated the pain with the litter. Cat litter is clean! I do not know how to change his behavior. I have tried putting his feces in the box, throwing him out at night I’ve drawn the line at strangling him. ( I wouldn’t do that but it sure crosses my mind) Please give me some advice. If he has had 2 bouts with painful urination he is probably associating boxes with pain. If he is the only kitty, I’d have 2 litter boxes,one in a new spot- he make not make a connection. Some humans are put on continous low dose antibiotics for recurring utinary tract infections- maybe vets can fo the same thing.